Madison Grimm works on her artwork. Photo: Emily Spartz, The Argus Leader. 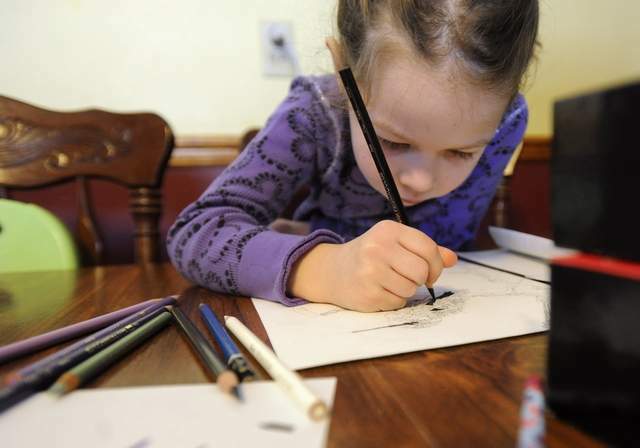 Madison Grimm, a six-year-old South Dakota girl who was announced as the US Fish and Wildlife Service winner of its annual junior duck stamp competition, recently got some bad news. Her entry was disqualified. FWS officials were unavailable for comment, according to a story in The Argus Leader. But Adam Grimm, her father and a professional wildlife artist, said they told him that she was not allowed to copy any previously published photographs. Madison used a graphite transfer technique to create her portrait of a canvasback duck. Her father complained that none of his photos had ever been published. Read more: South Dakota girl disqualified. This entry was posted in Uncategorized and tagged Conservation, Duck Stamp Competition, Ducks, South Dakota, U.S. Fish & Wildlife Service, Waterfowl, Wildlife. Bookmark the permalink.